Your donations help in so many ways from the expansion of the trails, trail maintenance and signage, GPS map development, web site development and so much more. Show your support and donate to the GRST today! The Gold Rush Trail (GRT) originated in the 1850s when many men traversed the great unknown to seek the ultimate golden motherlode in British Columbia. As the gold rush in California was coming to an end, the men journeyed north to Vancouver. From there they carried on, rushing into British Columbia’s interior. Today, we celebrate the GRT as homage to those who sought fame and fortune during a time plagued with hardship with the completion of section one in the proposed 463 kilometer Gold Rush Snowmobile Trail (GRST). Residents and visitors alike will enjoy immersing themselves into the historically rich past the trail has to offer. 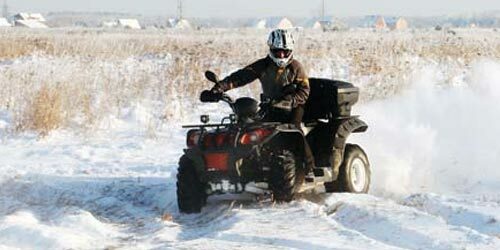 Though the title may be the Gold Rush Snowmobile Trail, this multi-use trail intended for use throughout the full year. Whether you desire a soft adventure or a rugged experience, you are sure to have the thrill of a lifetime when you explore both the GRT and the GRST. Since its initial concept some 20 years ago, the GRST has progressed to include a legally established portion from 70 Mile House to just south of Horsefly. The trail was originally intended to start at Clinton and end up in Wells-Barkerville linking communities such as 100 Mile House, Horsefly and Likely along the way. In 2009, the District of 100 Mile House and New Pathways to Gold Society secured provincial and federal government funding to clear the existing legally established portion of the trail of blown down and dead and dying mountain pine beetle infested trees. Since inception, well over $ 1 million has been expended on the trail in development and maintenance. 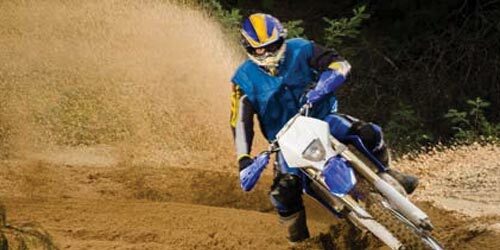 In 2011 a meeting was held between local stakeholders comprised of snowmobile retailers, snowmobile clubs, lodge owners, Recreation Sites and Trails Branch and New Pathways. The goal of the meeting was to determine the interest of the group in forming a management committee to champion completion and future operation of the GRST. As a result of the discussion it was recommended that a business plan be developed and that subsequent steps be taken which would involve the formalization of a management committee to deliver the elements of the business plan. In 2012 the business plan was completed and the GRST Management Committee was officially formed to implement the plan. 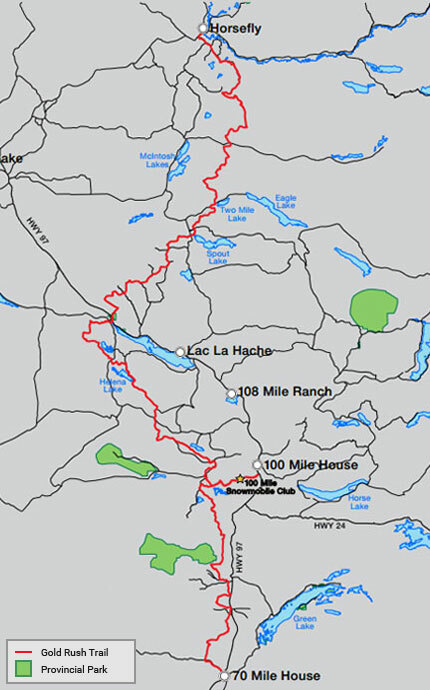 As the trail is significant in length with varying degrees of readiness and infrastructure the Business plan recommended a phased approach concentrating initially in the 100 Mile House area. 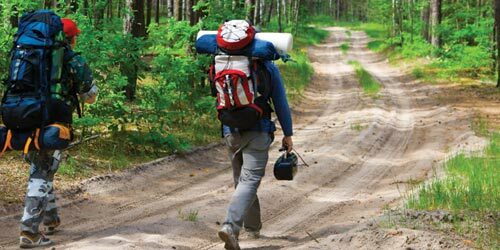 This phase would connect existing trails already managed by local clubs and formalize legal connections to communities to permit access to services and amenities such as fuel, food and accommodation. Lessons learned from phase 1 would be applied to other sections of the trail and subsequent phases. 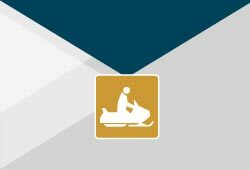 The Gold Rush Snowmobile Trail (GRST) is an initiative of the British Columbia Snowmobile Federation (BCSF) on behalf of their clubs. 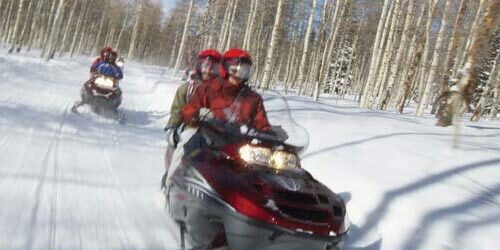 Snowmobile clubs local to the GRST include the Green Lake Snowmobile Club, 100 Mile House Snowmobile Club, the Williams Lake Powder Kings Snowmobile Club, the Quesnel Snowmobile Club, and the Wells Snowmobile Club. These five snowmobile clubs, in conjunction with Recreation Sites and Trails BC, maintain the GRST. 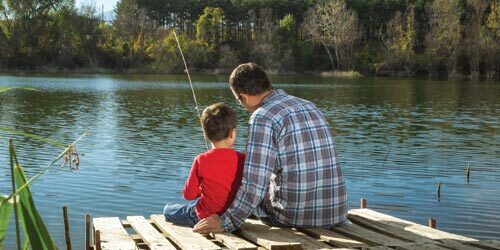 Each of the communities offers a wonderful experience, although the amenities available in each community vary greatly. We encourage you to explore. Although you can extend your ride beyond the Gold Rush Snowmobile Trail (GRST) or enjoy a ride around the GRST on the perimeter trail, it is hoped that the GRST will soon be formally extended. The proposed GRST is four-hundred and sixty-three kilometers long, eventually linking Clinton, 70 Mile House, 100 Mile House, Likely, and Wells. The remaining sections required for completion run from Clinton to 70 Mile House and from Horsefly to Wells. Show Your Support & Donate Today! In celebration of 50 years representing organized snowmobiling in BC, the GRST Organization created a group snowmobile ride in 2016. Riders departed Kamloops together on a week-long journey along the historic Gold Rush Snowmobile Trail to Wells/Barkerville. Along the way, riders had the opportunity to par-take in a number of tours and events that were designed around celebrating snowmobiling in beautiful British Columbia. Here are a list of valuable resources for more information. Recreation Sites and Trails BC (RSTBC) manages the majority of its recreation sites and trails through service contracts. Some 373 recreation sites and 200 recreation trails are managed and maintained under partnership agreements, on a cost recovery/non profit basis, with local recreation groups, forest companies, First Nations, regional districts, private contractors, and a range of other parties. Opportunities to manage recreation sites and trails under partnership agreements are often advertised in local newspapers through a Request for Proposal (RFP) process. Interested parties are invited to respond to the RFP by submitting proposals, which are then evaluated. Upon completion of the evaluation process, RSTBC awards partnership agreements to successful proponents. Agreement holders are responsible for managing recreation sites and trails to the standards specified in their partnership agreement. RSTBC is responsible for administering and monitoring agreement holders to ensure they carry out the responsibilities defined in the agreement. In addition, RSTBC may be responsible for replacing infrastructure, pumping toilets and removing hazard trees. The Gold Rush Snowmobile Trail (GRST) would like to thank everyone who has helped us to make our dreams come true. We are constantly receiving an astounding amount of support from volunteers and donors. With their passion and commitment, the GRST is increasingly becoming an even more astounding success. To find out who has already contributed, please visit the supporters page. We encourage you to get involved. Every person who volunteers greatly contributes to the GRST. Please visit the volunteer page to sign up as there are a number of jobs available for individuals with varied skills and abilities. If you would like to donate, please visit our donation page. No matter the commitment you are able to make, you can make a difference. All funds raised through gracious donations are placed towards the ongoing maintenance of the trail which includes clearing, signing and grooming. The specific location will be decided in consultation with the BCSF and the Regional Management Committee. Your donations help in keeping the Gold Rush Snowmobile Trail active and maintained. Donate Today!